Before I get cracking with the recipe for this gorgeous tart, I want to ask you just to take a long, lingering look at the photo above. Doesn’t it look deliciously delectable gotta-grab-it-off-the-screen-and-eat-it YUM? This recipe is why I love food, and why can never stay vegetarian for too long. Because bacon. And cheese. And rich, silky, eggy custard, baked into a creamy, salty, savoury delight that will have you begging ‘MORE’. 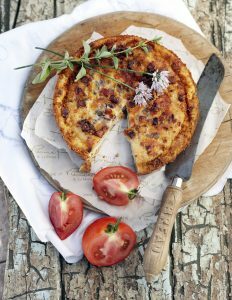 Many versions of bacon tart appear in old cookbooks. All the recipes are basically a variation on a salty ‘bread pudding’ made from egg custard, bread and breakfast bacon or ham. This recipe is a firm favourite and can easily be prepared in a large pie dish for a group of people, or as individual portions. Preheat the oven to 160°C (325 °F). Grease an ovenproof dish with 1 Tbsp (15 ml) of the butter and dust with the breadcrumbs. Refrigerate for 15 minutes to set. Heat a little butter or oil in a pan and sauté the onion, garlic and bacon for 5 minutes until done. Spread each slice of bread, on one side only, with the remaining butter. Lay the buttered bread in layers in the dish, buttered side up, sprinkling the sautéed onion and bacon mixture over each layer. Mix the eggs, buttermilk or milk, cheese, allspice and cayenne pepper together. Season to taste with salt and black pepper. Pour the mixture over the bread in the ovenproof dish and bake for 15-20 minutes until golden and set. Sprinkle with spring onions if using. Either turn out and service in slices, or serve directly from the dish.